Treating a critically ill infant requires a unique skill set that can only come from hands-on, real time experience. Knowing what to look for and how to find answers—quickly and with no mistakes—is essential. But this kind of experience can’t come from exposure to critical care situations in practice. The stakes are simply too high and the patients too precious. When a parent hands over their sick baby to a medical professional, they are counting on a miracle. 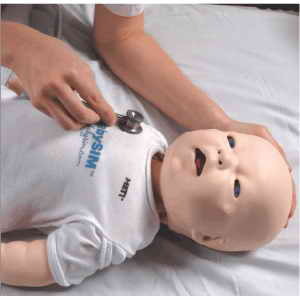 The BabySIM makes it possible to prepare learners for interaction with our most vulnerable patients—in a safe, realistic learning environment. Intricate details such as realistic touch and feel, clinched fists and a loving layer of baby fat help create an appropriate representation of a six- to nine-month old infant. 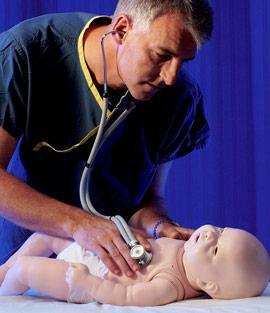 The educational value of the BabySIM is summed up in the fact that critical care interventions—such as infant CPR, airway management, drug administration and defibrillation, to name a few—can be practiced on the simulator, better preparing healthcare professionals for critical events involving infants.